Episode 8 of Insider’s View comes from Fiona Briers who runs the brilliant Bright Solutions in Vietnam. The work they do to empower women and produce gorgeous handicrafts is fabulous. She’s been here almost 9 years so I’d say she has a very good insight into what makes Saigon tick. Enjoy. My name is Fiona Briers. 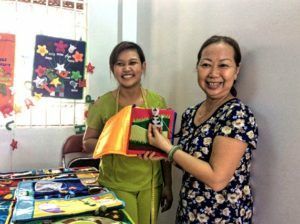 I’m an Australian, Founding Director of Bright Solutions Vietnam, a boutique workshop and handicrafts company specializing in children’s educational resources. Since 2009. And wow! have there been many changes in that time! Vietnam’s rapid development is evident in its ever-expanding position in the foreign market place and through its strategic growth and investment in the international tourist industry. I arrived before the Bitexco Tower in HCMC was finished; at the time it was the tallest skyscraper (the only one!) on the skyline. Now, office blocks and high-rise buildings are being built all over the city. 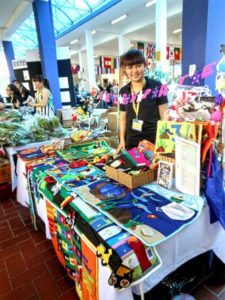 Bright Solutions is a boutique handicrafts business in Ho Chi Minh City, focused on “empowering women, challenging poverty” amongst the urban disadvantaged (District 8) where poverty is real, constant, and often generational. Although established as a profit-making small business, its focus is on social enterprise and on the women who participate in its program. Learning new skills for a new life. Our niche market is in premium quality early childhood learning resources. 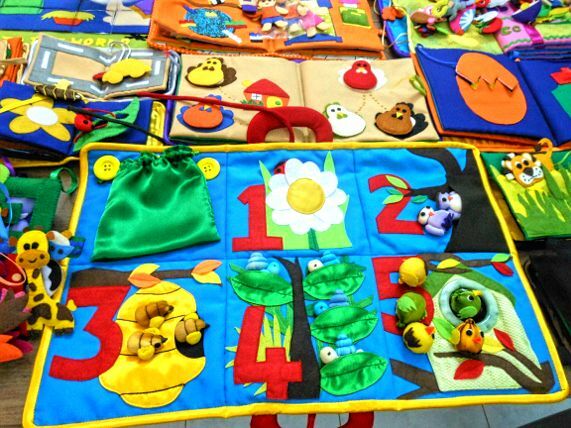 Our range includes stunning, eye-catching quiet books of various themes, sensory play mats, pram strings, finger puppet sets, customized Name Banners as well as a variety of Christmas decorations. 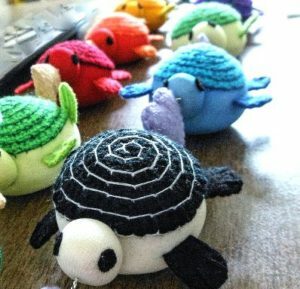 All Bright Solutions products are stunningly unique, locally designed and individually crafted to rival the international marketplace. Why did you choose Ho Chi Minh City to live and start your business? A bundle of color and fun from the team at Bright Solutions. It was a heart call to Vietnam; and a contact in HCMC. The people of Vietnam have a rich and beautiful culture but history has left a legacy of some very harsh and tragic experiences for many. The nation is moving forward, to its great credit, but the majority of Vietnamese are not yet able to catch this fast-moving train due to huge gaps in education or the constant pressure to survive on a daily basis. 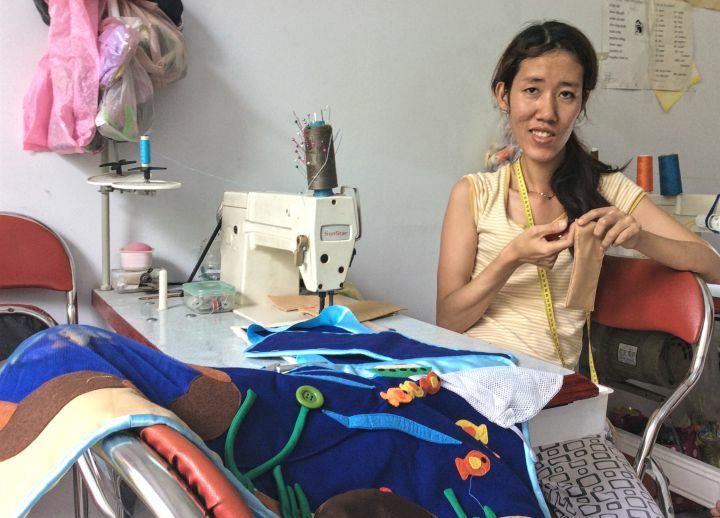 Bright Solutions began in HCMC, the central hub of business and trade, out of the desire to reduce these gaps, particularly amongst women, by contributing a starting point to halt the poverty cycle. A tiny drop in an ocean, but nevertheless a difference for one woman at a time. The chaos, the vitality, the people, the lifestyle! I don’t live here to bring my home culture to this land, but to celebrate what Vietnam has and is. The more I engage in this city, the more I learn from it! 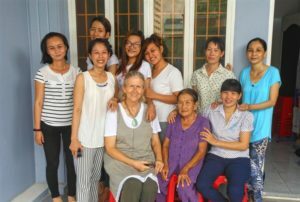 Vietnamese people who have not had much experience with foreigners (especially out of tourist areas) lack the confidence to communicate either due to language or culture. They are curious and watch, but often expressionless. This may be off-putting to those new to the Asian experience! My suggestion: “smile” even if it’s not returned, and persevere – it’s worth the wait! Over the years I’ve experienced many coffee shops; the distinct pattern of HCMC’s ever-evolving development means there is a continual change in venues and ownership! Cafes and restaurants close, new ones open at a rapid rate, so one recommendation today may not be there tomorrow! However, one favourite coffee stop of mine is the outdoor courtyard of Vatel restaurant in D1. It’s a quiet space (a rarity) but has fantastic customer service! Evenings have one very attentive staff, ever-vigilant to keep the tea cup filled! Highly commendable! For those with hearty appetites, Journeys Sandwich Café in D1 is also a favourite spot. IIt’sexpanded menu caters to a range of different tastes, but if you’re in need of a sandwich, you’ll certainly not leave unsatisfied! I love to walk! You see far more of the true Vietnam on the streets. 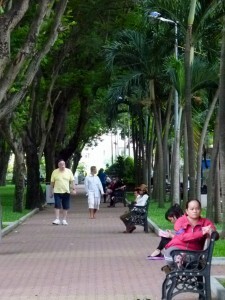 Visit the Tao Dan Park, D1 in the early mornings to enjoy the cooler temperatures and watch the vitality of the city. It’s full of folk exercising, sharing life and community. Or stop for a chat with local students in 23/9 Park in Le Lai street; a great location to meet young people seeking opportunities to practice their English. The City Sights walking tour; the War Remnants Museum; walk in and out of the tiny lanes around Pham Ngu Lao; try Vietnamese pancake (banh xeo); learn and try 5 words in Vietnamese! Great laughs, but goes a long way to breaking down barriers! What has been, or is, your NUMBER 1 HO CHI MINH CITY HIGHLIGHT? Meeting and engaging with the local people. Tip: invest a little time to talk with hotel or service staff you meet to get a tiny insight into their lives. I’ll guarantee it makes your experience of this beautiful city richer. Coming to a different culture is exactly that – different! Hence, don’t expect things to be done the way they are in your home culture. Celebrate the differences! There are times when customer service may frustrate you, but getting angry will not get you anywhere – people lose respect when they do. So breathe deep, be patient, remain calm! Editors Note: Wow, some great advice from Fiona. What a great organization and how gorgeous are the products. What fabulous gifts they’d make for your gorgeous grandkids or a kindergarten teacher. And, with Christmas coming up the decorations are superb. The good news is that you can get involved as well even if you’re not in Vietnam. Interested? Take a look HERE. If you want to keep up with the latest products, check out their Facebook Page. Previous story Bonsai Saigon River Cruise – Resurrection!